Become familiar with concepts related to XStream Out. XStream Out can capture transactions from the redo log of an Oracle database and send them efficiently to a client application. Become familiar with concepts related to capture processes. With XStream Out, an outbound server sends database changes to a client application. An XStream Out outbound server streams LCRs that were captured by a capture process to a client application. The position of an LCR identifies its placement in the stream of LCRs in a transaction. There are considerations for XStream Out and distributed transactions. Understand security related to the client application and XStream components, as well as the privileges required by the capture user and the connect user. XStream Out can work with other Oracle Database components. XStream Out provides a transaction-based interface for streaming these changes to client applications. The client application can interact with other systems, including non-Oracle systems, such as non-Oracle databases or file systems. In an XStream Out configuration, a capture process captures database changes and sends these changes to an outbound server. This section describes capture processes and outbound servers in detail. XStream Out has both OCI and Java interfaces and supports most of the data types that are supported by Oracle Database, including LOBs, LONG, LONG RAW, and XMLType. A capture process is an optional Oracle background process that scans the database redo log to capture DML and DDL changes made to database objects. A capture process can capture changes made to columns of most data types. A capture process can capture different types of DML changes. You can configure a capture process to run locally on a source database or remotely on a downstream database. Enabling and disabling restricted session affects capture processes. The capture process subcomponents are a reader server, one or more preparer servers, and a builder server. The state of a capture process describes what the capture process is doing currently. Capture process parameters control the way a capture process operates. A checkpoint is information about the current state of a capture process that is stored persistently in the data dictionary of the database running the capture process. Specific system change number (SCN) values are important for a capture process. The primary function of the redo log is to record all of the changes made to the database. A capture process captures database changes from the redo log, and the database where the changes were generated is called the source database for the capture process. When a capture process captures a database change, it converts it into a specific message format called a logical change record (LCR). In an XStream Out configuration, the capture process sends these LCRs to an outbound server. Figure 3-1 shows a capture process. Description of "Figure 3-1 Capture Process"
A capture process can run on its source database or on a remote database. When a capture process runs on its source database, the capture process is a local capture process. You can also capture changes for the source database by running the capture process on different server. When a capture process runs on a remote database, the capture process is called a downstream capture process, and the remote database is called the downstream database. The log files are written to the remote database and to the source database. In this configuration, the source logfiles must be available at the downstream capture database. The capture process on the remote database mines the logs from the source database and stages them locally. This configuration can be helpful when you want to offload the processing of capture changes from a production database to different, remote database. At all replication sites, street_address must be VARCHAR2(40), postal_code must be VARCHAR2(10), city must be VARCHAR2(30), and so on. The maximum size of the VARCHAR2, NVARCHAR2, and RAW data types has been increased in Oracle Database 12c when the COMPATIBLE initialization parameter is set to 12.0.0 and the MAX_STRING_SIZE initialization parameter is set to EXTENDED. Varrays are not supported, but object type attributes can include varrays. XMLType stored as a CLOB is deprecated in this release. An ID key LCR is a special type of row LCR. ID key LCRs enable an XStream client application to process changes to rows that include unsupported data types. A demo is available that creates a sample client application that processes ID key LCRs. The following Oracle-supplied types: ANYTYPE, ANYDATASET, URI types, SDO_TOPO_GEOMETRY, SDO_GEORASTER, and Expression. These data type restrictions pertain to both ordinary (heap-organized) tables and index-organized tables. ID key LCRs do not contain all of the columns for a row change. Instead, they contain the rowid of the changed row, a group of key columns to identify the row in the table, and the data for the scalar columns of the table that are supported by XStream Out. ID key LCRs do not contain data for columns of unsupported data types. If the application does not require the data in the unsupported columns, then the application can process the values of the supported columns in the ID key LCRs normally. If the application requires the data in the unsupported columns, then the application can use the information in an ID key LCR to query the correct row in the database and consume the unsupported data for the row. NONE for tables that are not supported by XStream Out. Even ID key LCRs cannot be used to process changes to rows in tables that show NONE in the DBA_XSTREAM_OUT_SUPPORT_MODE view. "Setting a Capture Process Parameter"
Specifically, the client application attaches to an XStream outbound server and waits for LCRs from the outbound server. When the client application receives an ID key LCR, it can query the appropriate source database table using the rowid in the ID key LCR. A capture process converts each MERGE change into an INSERT or UPDATE change. MERGE is not a valid command type in a row LCR. A single database can have one or more capture processes that capture local changes and other capture processes that capture changes from a remote source database. That is, you can configure a single database to perform both local capture and downstream capture. Local capture means that a capture process runs on the source database. Downstream capture means that a capture process runs on a database other than the source database. Figure 3-1 shows a database using local capture. With local capture, the capture actions are performed at the source database. Local capture has several advantages. The DBMS_CAPTURE_ADM.BUILD procedure is run to extract (or build) the data dictionary to the redo log. Supplemental logging at the source database places additional information in the redo log. This information might be needed when captured changes are processed by an XStream client application. See "If Required, Configure Supplemental Logging". The first time a capture process is started at the database, Oracle Database uses the extracted data dictionary information in the redo log to create a LogMiner data dictionary, which is separate from the primary data dictionary for the source database. Additional capture processes can use this existing LogMiner data dictionary, or they can create new LogMiner data dictionaries. A capture process scans the redo log for changes using LogMiner. The rules engine evaluates changes based on the rules in one or more of the capture process rule sets. The capture process enqueues changes that satisfy the rules in its rule sets into a local ANYDATA queue. If the captured changes are shared with one or more outbound servers on other databases, then one or more propagations propagate these changes from the source database to the other databases. Configuration and administration of the capture process is simpler than when downstream capture is used. When you use local capture, you do not need to configure redo data copying to a downstream database, and you administer the capture process locally at the database where the captured changes originated. A local capture process can scan changes in the online redo log before the database writes these changes to an archived redo log file. When you use an archived-log downstream capture process, archived redo log files are copied to the downstream database after the source database has finished writing changes to them, and some time is required to copy the redo log files to the downstream database. However, a real-time downstream capture process can capture changes in the online redo log sent from the source database. The amount of data being sent over the network is reduced, because the redo data is not copied to the downstream database. Even if captured LCRs are propagated to other databases, the captured LCRs can be a subset of the total changes made to the database, and only the LCRs that satisfy the rules in the rule sets for a propagation are propagated. Security might be improved because only the source (local) database can access the redo data. For example, if the capture process captures changes in the hr schema only, then, when you use local capture, only the source database can access the redo data to enqueue changes to the hr schema into the capture process queue. However, when you use downstream capture, the redo data is copied to the downstream database, and the redo data contains all of the changes made to the database, not just the changes made to a specific object or schema. The following types of downstream capture configurations are possible: real-time downstream capture and archived-log downstream capture. The downstream_real_time_mine capture process parameter controls whether a downstream capture process performs real-time downstream capture or archived-log downstream capture. A real-time downstream capture process and one or more archived-log downstream capture processes can coexist at a downstream database. With downstream capture, the redo log files of the source database must be available at the downstream database. References to "downstream capture processes" in this document apply to both real-time downstream capture processes and archived-log downstream capture processes. This document distinguishes between the two types of downstream capture processes when necessary. A downstream capture process only can capture changes from a single source database. However, multiple downstream capture processes at a single downstream database can capture changes from a single source database or multiple source databases. The advantage of real-time downstream capture over archived-log downstream capture is that real-time downstream capture reduces the amount of time required to capture changes made at the source database. The advantage of archived-log downstream capture over real-time downstream capture is that archived-log downstream capture allows downstream capture processes from multiple source databases at a downstream database. With downstream capture, most capture actions are performed at the downstream database. Downstream capture provides several advantages. When you create or alter a downstream capture process, you optionally can specify the use of a database link from the downstream database to the source database. Some operational requirements apply to downstream capture. The time is reduced because the real-time downstream capture process does not need to wait for the redo log file to be archived before it can capture data from it. Redo transport services sends redo data to the downstream database either synchronously or asynchronously. At the same time, the log writer process (LGWR) records redo data in the online redo log at the source database. A remote file server process (RFS) at the downstream database receives the redo data over the network and stores the redo data in the standby redo log. A log switch at the source database causes a log switch at the downstream database, and the ARCHn process at the downstream database archives the current standby redo log file. The real-time downstream capture process captures changes from the standby redo log whenever possible and from the archived standby redo log files whenever necessary. A capture process can capture changes in the archived standby redo log files if it falls behind. When it catches up, it resumes capturing changes from the standby redo log. Description of "Figure 3-2 Real-Time Downstream Capture"
You can configure more than one real-time downstream capture process that captures changes from the same source database, but you cannot configure real-time downstream capture for multiple source databases at one downstream database. An archived-log downstream capture configuration means that archived redo log files from the source database are copied to the downstream database, and the capture process captures changes in these archived redo log files. You can copy the archived redo log files to the downstream database using redo transport services, the DBMS_FILE_TRANSFER package, file transfer protocol (FTP), or some other mechanism. Description of "Figure 3-3 Archived-Log Downstream Capture"
You can copy redo log files from multiple source databases to a single downstream database and configure multiple archived-log downstream capture processes to capture changes in these redo log files. The first time a downstream capture process is started at the downstream database, Oracle Database uses data dictionary information in the redo data from the source database to create a LogMiner data dictionary at the downstream database. The DBMS_CAPTURE_ADM.BUILD procedure is run at the source database to extract the source data dictionary information to the redo log at the source database. Next, the redo data is copied to the downstream database from the source database. Additional downstream capture processes for the same source database can use this existing LogMiner data dictionary, or they can create new LogMiner data dictionaries. Also, a real-time downstream capture process can share a LogMiner data dictionary with one or more archived-log downstream capture processes. A capture process scans the redo data from the source database for changes using LogMiner. The capture process enqueues changes that satisfy the rules in its rule sets into a local ANYDATA queue. The capture process formats the changes as LCRs. The DBMS_CAPTURE_ADM.BUILD procedure is run at the source database to extract the data dictionary to the redo log. Supplemental logging at the source database places additional information that might be needed for apply in the redo log. See "If Required, Configure Supplemental Logging". In addition, the redo data must be copied from the computer system running the source database to the computer system running the downstream database. 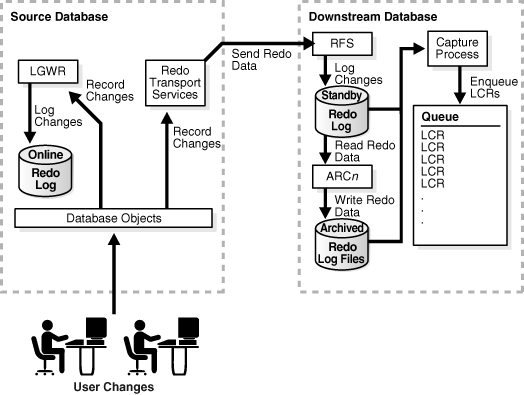 In a real-time downstream capture configuration, redo transport services sends redo data to the downstream database. Typically, in an archived-log downstream capture configuration, redo transport services copies the archived redo log files to the downstream database. Capturing changes uses fewer resources at the source database because the downstream database performs most of the required work. If you plan to capture changes originating at multiple source databases, then capture process administration can be simplified by running multiple archived-log downstream capture processes with different source databases at one downstream database. That is, one downstream database can act as the central location for change capture from multiple sources. In such a configuration, one real-time downstream capture process can run at the downstream database in addition to the archived-log downstream capture processes. Copying redo data to one or more downstream databases provides improved protection against data loss. For example, redo log files at the downstream database can be used for recovery of the source database in some situations. The ability to configure at one or more downstream databases multiple capture processes that capture changes from a single source database provides more flexibility and can improve scalability. This database link must have the same name as the global name of the source database. Such a database link simplifies the creation and administration of a downstream capture process. You specify that a downstream capture process uses a database link by setting the use_database_link parameter to TRUE when you run the CREATE_CAPTURE or ALTER_CAPTURE procedure on the downstream capture process. The name of the database link must match the global name of the source database. In certain situations, runs the DBMS_CAPTURE_ADM.BUILD procedure at the source database to extract the data dictionary at the source database to the redo log when a capture process is created. Obtains the first SCN for the downstream capture process if the first system change number (SCN) is not specified during capture process creation. The first SCN is needed to create a capture process. If a downstream capture process does not use a database link, then you must perform these actions manually. During the creation of a downstream capture process, if the first_scn parameter is set to NULL in the CREATE_CAPTURE procedure, then the use_database_link parameter must be set to TRUE. Otherwise, an error is raised. The source database must be running at least Oracle Database 10g Release 2 (10.2). The XStream Out downstream capture database must be running Oracle Database 11g Release 2 (11.2.0.3) or later and the source database must be running Oracle Database 10g Release 2 (10.2) or later. The operating system on the source and downstream capture sites must be the same, but the operating system release does not need to be the same. In addition, the downstream sites can use a directory structure that is different from the source site. The hardware architecture on the source and downstream capture sites must be the same. For example, a downstream capture configuration with a source database on a 64-bit Sun system must have a downstream database that is configured on a 64-bit Sun system. Other hardware elements, such as the number of CPUs, memory size, and storage configuration, can differ in the source and downstream sites. When you enable restricted session during system startup by issuing a STARTUP RESTRICT statement, capture processes do not start, even if they were running when the database shut down. When restricted session is disabled with an ALTER SYSTEM statement, each capture process that was running when the database shut down is started. When restricted session is enabled in a running database by the SQL statement ALTER SYSTEM ENABLE RESTRICTED SESSION clause, it does not affect any running capture processes. These capture processes continue to run and capture changes. If a stopped capture process is started in a restricted session, then the capture process does not actually start until the restricted session is disabled. A capture process is an optional Oracle background process whose process name is CPnn, where nn can include letters and numbers. A capture process captures changes from the redo log by using the infrastructure of LogMiner. XStream configures LogMiner automatically. You can create, alter, start, stop, and drop a capture process, and you can define capture process rules that control which changes a capture process captures. The parallelism capture process parameter controls capture process parallelism. When capture process parallelism is 0 (zero), the default for XStream Out, the capture process does not use subcomponents to perform its work. Instead, the CPnn process completes all of the tasks required to capture database changes. When capture process parallelism is greater than 0, the capture process uses the underlying LogMiner process name is MSnn, where nn can include letters and numbers. When capture process parallelism is 0 (zero), the capture process does not use this process. One reader server that reads the redo log and divides the redo log into regions. One or more preparer servers that scan the regions defined by the reader server in parallel and perform prefiltering of changes found in the redo log. Prefiltering involves sending partial information about changes, such as schema and object name for a change, to the rules engine for evaluation, and receiving the results of the evaluation. You can control the number of preparer servers using the parallelism capture process parameter. One builder server that merges redo records from the preparer servers. These redo records either evaluated to TRUE during partial evaluation or partial evaluation was inconclusive for them. The builder server preserves the system change number (SCN) order of these redo records and passes the merged redo records to the capture process. Each reader server, preparer server, and builder server is a process. You can view the state of a capture process by querying the STATE column in the V$XSTREAM_CAPTURE dynamic performance view. For example, the parallelism capture process parameter controls the number of preparer servers used by a capture process, and the time_limit capture process parameter specifies the amount of time a capture process runs before it is shut down automatically. You set capture process parameters using the DBMS_CAPTURE_ADM.SET_PARAMETER procedure. After creation, a capture process is disabled so that you can set the capture process parameters for your environment before starting it for the first time. A capture process tries to record a checkpoint at regular intervals called checkpoint intervals. The system change number (SCN) that corresponds to the lowest checkpoint for which a capture process requires redo data is the required checkpoint SCN. The SCN that corresponds to the last physical checkpoint recorded by a capture process is the maximum checkpoint SCN. The checkpoint retention time is the amount of time, in number of days, that a capture process retains checkpoints before purging them automatically. The redo log file that contains the required checkpoint SCN, and all subsequent redo log files, must be available to the capture process. If a capture process is stopped and restarted, then it starts scanning the redo log from the SCN that corresponds to its required checkpoint SCN. The required checkpoint SCN is important for recovery if a database stops unexpectedly. Also, if the first SCN is reset for a capture process, then it must be set to a value that is less than or equal to the required checkpoint SCN for the captured process. You can determine the required checkpoint SCN for a capture process by querying the REQUIRED_CHECKPOINT_SCN column in the ALL_CAPTURE data dictionary view. The maximum checkpoint SCN can be lower than or higher than the required checkpoint SCN for a capture process. The maximum checkpoint SCN can also be 0 (zero) if the capture process is new and has not yet recorded a physical checkpoint. A capture process periodically computes the age of a checkpoint by subtracting the NEXT_TIME of the archived redo log file that corresponds to the checkpoint from FIRST_TIME of the archived redo log file containing the required checkpoint SCN for the capture process. If the resulting value is greater than the checkpoint retention time, then the capture process automatically purges the checkpoint by advancing its first SCN value. Otherwise, the checkpoint is retained. You can use the ALTER_CAPTURE procedure in the DBMS_CAPTURE_ADM package to set the checkpoint retention time for a capture process. The DBA_REGISTERED_ARCHIVED_LOG view displays the FIRST_TIME and NEXT_TIME for archived redo log files, and the REQUIRED_CHECKPOINT_SCN column in the ALL_CAPTURE view displays the required checkpoint SCN for a capture process. You can query the ALL_CAPTURE data dictionary view to display these values for one or more capture processes. The captured SCN is the SCN that corresponds to the most recent change scanned in the redo log by a capture process. The applied SCN for a capture process is the SCN of the most recent LCR processed by the relevant outbound server. The first SCN and start SCN are important for a capture process. All LCRs lower than the applied SCN have been processed by all outbound servers that process changes captured by the capture process. The applied SCN for a capture process is equivalent to the low-watermark SCN for an outbound server that processes changes captured by the capture process. The first SCN is the lowest SCN in the redo log from which a capture process can capture changes. The start SCN is the SCN from which a capture process begins to capture changes. If you specify a start SCN when you create or alter a capture process, then the start SCN specified must be greater than or equal to the first SCN for the capture process. If you specify a first SCN during capture process creation, then the database must be able to access redo data from the SCN specified and higher. The value returned for the NAME column is the name of the redo log file that contains the SCN corresponding to the first SCN. This redo log file, and all subsequent redo log files, must be available to the capture process. If this query returns multiple distinct values for FIRST_CHANGE#, then the DBMS_CAPTURE_ADM.BUILD procedure has been run more than once on the source database. In this case, choose the first SCN value that is most appropriate for the capture process you are creating. In some cases, the DBMS_CAPTURE_ADM.BUILD procedure is run automatically when a capture process is created. When this happens, the first SCN for the capture process corresponds to this data dictionary build. The start SCN is the SCN from which a capture process begins to capture changes. You can specify a start SCN that is different than the first SCN during capture process creation, or you can alter a capture process to set its start SCN. The start SCN does not need to be modified for normal operation of a capture process. Typically, you reset the start SCN for a capture process if point-in-time recovery must be performed on one of the destination databases that receive changes from the capture process. In these cases, the capture process can capture the changes made at the source database after the point-in-time of the recovery. An existing capture process must be stopped before setting its start SCN. A capture process always scans any unscanned redo log records that have higher SCN values than the first SCN, even if the redo log records have lower SCN values than the start SCN. So, if you specify a start SCN that is greater than the first SCN, then the capture process might scan redo log records for which it cannot capture changes, because these redo log records have a lower SCN than the start SCN. Scanning redo log records before the start SCN should be avoided if possible because it can take some time. Therefore, Oracle recommends that the difference between the first SCN and start SCN be as small as possible during capture process creation to keep the initial capture process startup time to a minimum. When a capture process is started or restarted, it might need to scan redo log files with a FIRST_CHANGE# value that is lower than start SCN. Removing required redo log files before they are scanned by a capture process causes the capture process to abort. You can query the ALL_CAPTURE data dictionary view to determine the first SCN, start SCN, and required checkpoint SCN. A capture process needs the redo log file that includes the required checkpoint SCN, and all subsequent redo log files. An outbound server is an optional Oracle background process that sends database changes to a client application. Outbound servers support all of the data types that are supported by capture processes. The apply user for an outbound server is the user who receives LCRs from the outbound server's capture process. Enabling and disabling restricted session affects outbound servers. An outbound server consists of a reader server, a coordinator process, and an apply server. There are several considerations for XStream outbound servers. Apply parameters control the behavior of outbound servers. Specifically, a client application can attach to an outbound server and extract database changes from LCRs. A client application attaches to the outbound server using OCI or Java interfaces. A client application can create multiple sessions. Each session can attach to only one outbound server, and each outbound server can serve only one session at a time. However, different client application sessions can connect to different outbound servers or inbound servers. Change capture can be performed on the same database as the outbound server or on a different database. When change capture is performed on a different database from the one that contains the outbound server, a propagation sends the changes from the change capture database to the outbound server database. Downstream capture is also a supported mode to reduce the load on the source database. When both the outbound server and its capture process are enabled, data changes, encapsulated in row LCRs and DDL LCRs, are sent to the outbound server. The outbound server can publish LCRs in various formats, such as OCI and Java. The client application can process LCRs that are passed to it from the outbound server or wait for LCRs from the outbound server by using a loop. An outbound server sends LOB, LONG, LONG RAW, and XMLType data to the client application in chunks. Several chunks comprise a single column value of LOB, LONG, LONG RAW, or XMLType data type. Figure 3-4 shows an outbound server configuration. Description of "Figure 3-4 XStream Out Outbound Server"
The client application can detach from the outbound server whenever necessary. When the client application re-attaches, the outbound server automatically determines where in the stream of LCRs the client application was when it detached. The outbound server starts sending LCRs from this point forward. Outbound servers can send LCRs that include changes to columns of these data types to XStream client applications. "Data Types Captured by a Capture Process"
The apply user for an outbound server must match the capture user for the outbound server's capture process. "Privileges Required by the Capture User for a Capture Process"
When restricted session is enabled during system startup by issuing a STARTUP RESTRICT statement, outbound servers do not start, even if they were running when the database shut down. When the restricted session is disabled, each outbound server that was not stopped is started. When restricted session is enabled in a running database by the SQL statement ALTER SYSTEM ENABLE RESTRICTED SESSION, it does not affect any running outbound servers. These outbound servers continue to run and send LCRs to an XStream client application. If a stopped outbound server is started in a restricted session, then the outbound server does not actually start until the restricted session is disabled. A reader server that receives LCRs from the outbound server's capture process. The reader server is a process that computes dependencies between LCRs and assembles LCRs into transactions. The reader server then returns the assembled transactions to the coordinator process. You can view the state of the reader server for an outbound server by querying the V$XSTREAM_APPLY_READER dynamic performance view. See Oracle Database Reference . A coordinator process that gets transactions from the reader server and passes them to apply servers. The coordinator process name is APnn, where nn can include letters and numbers. The coordinator process is an Oracle background process. You can view the state of a coordinator process by querying the V$XSTREAM_APPLY_COORDINATOR dynamic performance view. See Oracle Database Reference . An apply server that sends LCRs to an XStream client application. The apply server is a process. If the apply server encounters an error, then it then it records information about the error in the ALL_APPLY view. You can view the state of the apply server for an outbound server by querying the V$XSTREAM_APPLY_SERVER dynamic performance view. See Oracle Database Reference . The reader server and the apply server process names are ASnn, where nn can include letters and numbers. LCRs processed by an outbound server must be LCRs that were captured by a capture process. An outbound server does not support LCRs that were constructed by applications. A single outbound server can process captured LCRs from only one source database. The source database is the database where the changes encapsulated in the LCRs were generated in the redo log. The source database for the changes captured by a capture process must be at 10.2.0 or higher compatibility level for these changes to be processed by an outbound server. The capture process for an outbound server must be running on an Oracle Database 11g Release 2 (11.2) or later database. A single capture process cannot capture changes for both an outbound server and an apply process. However, a single capture process can capture changes for multiple outbound servers. Automatic split and merge of a stream is possible when the capture process and the outbound server for the stream run on different databases. However, when the capture process and outbound server for a stream run on the same database, automatic split and merge of the stream is not possible. See Oracle Streams Replication Administrator's Guide for information about automatic split and merge. An outbound server's LCRs can spill from memory to hard disk if they have been in the buffered queue for a period of time without being processed, if there are a large number of LCRs in a transaction, or if there is not enough space in memory to hold all of the LCRs. An outbound server performs best when a minimum of LCRs spill from memory. You can control an outbound server's behavior regarding spilled LCRs using the txn_age_spill_threshold and txn_lcr_spill_threshold apply parameters. See Oracle Database PL/SQL Packages and Types Reference for information about these apply parameters. See Oracle Streams Replication Administrator's Guide . In LCRs that were captured by a capture process, there is additional information related to LCR position. The processed low position is a position below which all transactions have been processed by the client application. To minimize network latency, the outbound server streams LCRs to the client application with time-based acknowledgments. For example, the outbound server might send an acknowledgment every 30 seconds. "Position Order in an LCR Stream"
The scn_from_position attribute contains the SCN of the LCR. The commit_scn_from_position attribute contains the commit SCN of the transaction to which the LCR belongs. The scn_from_position and commit_scn_from_position attributes are not present in explicitly captured row LCRs. If the outbound server or the client application stops abnormally, then the connection between the two is broken automatically. In this case, the client application must roll back all incomplete transactions. The client application must maintain its processed low position to recover properly after either it or the outbound server (or both) are restarted. The processed low position indicates that the client application has processed all LCRs that are less than or equal to this value. The client application can update the processed low position for each transaction that it consumes. The client application can pass a processed low position to the outbound server that is equal to or greater than the outbound server's processed low position. In this case, the outbound server resumes streaming LCRs from the first LCR that has a position greater than the client application's processed low position. The client application can pass a processed low position to the outbound server that is less than the outbound server's processed low position. In this case, the outbound server raises an error. The client application can pass NULL to the outbound server. In this case, the outbound server determines the processed low position automatically and starts streaming LCRs from the LCR that has a position greater than this processed low position. When this happens, the client application must suppress or discard each LCR with a position less than or equal to the client application's processed low position. "Displaying the Processed Low Position for an Outbound Server"
This streaming protocol fully utilizes the available network bandwidth, and the performance is unaffected by the presence of a wide area network (WAN) separating the sender and the receiver. The outbound server extends the underlying Oracle Streams infrastructure, and the outbound server maintains the streaming performance rate. Using OCI, you can control the time period of the interval by setting the OCI_ATTR_XSTREAM_ACK_INTERVAL attribute through the OCI client application. The default is 30 seconds. Using Java, you can control the time period of the interval by setting the batchInterval parameter in the attach method in the XStreamOut class. The client application can specify this interval when it invokes the attach method. If the interval is large, then the outbound server can stream out more LCRs for each acknowledgment interval. However, a longer interval delays how often the client application can send the processed low position to the outbound server. Therefore, a longer interval might mean that the processed low position maintained by the outbound server is not current. In this case, when the outbound server restarts, it must start processing LCRs at an earlier position than the one that corresponds to the processed low position maintained by the client application. Therefore, more LCRs might be retransmitted, and the client application must discard the ones that have been applied. Use the XA interface, as exposed by the DBMS_XA supplied PL/SQL package or by the OCI or JDBC libraries. The XA interface implements X/Open Distributed Transaction Processing (DTP) architecture. In an XStream Out configuration, changes made to the source database during a distributed transaction using either of the preceding methods are streamed to an XStream outbound server. The outbound server sends the changes in a transaction to the XStream client application after the transaction has committed. However, the distributed transaction state is not replicated or sent. The client application does not inherit the in-doubt or prepared state of such a transaction. Also, XStream does not replicate or send the changes using the same global transaction identifier used at the source database for XA transactions. XStream supports replication of changes made by loosely coupled XA branches regardless of the COMPATIBLE initialization parameter value. XStream supports replication of changes made by tightly coupled branches on an Oracle RAC source database only if the COMPATIBLE initialization parameter is set to 11.2.0.0 or higher. There are security considerations for the client application because XStream Out allows it to receive LCRs. All the components of the XStream Out configuration run as the same XStream administrator. This user can be either a trusted user with a high level of privileges, or it can be an untrusted user that has only the privileges necessary for performing certain tasks. Changes are captured in the security domain of the capture user for a capture process. The capture user captures all changes that satisfy the capture process rule sets. The capture user must have the necessary privileges to perform these actions. An outbound server sends LCRs to an XStream client application in the security domain of its connect user. After an XStream Out application receives LCRs, the application might save the contents of LCRs to a file or generate the SQL statements to execute the LCRs on a non-Oracle database. Java and OCI client applications must connect to an Oracle database before attaching to an XStream outbound server created on that database. The connected user must be the same as the connect_user configured for the outbound server. Otherwise, an error is raised. XStream does not assume that the connected user to the outbound server is trusted. The XStream Java layer API relies on Oracle JDBC security because XStream accepts the Oracle JDBC connection instance created by client application in the XStream attach method in the XStreamOut class. The connected user is validated as an XStream user. The security model of the XStream administrator also determines the data dictionary views that this user can query to monitor the XStream configuration. The trusted administrator can monitor XStream with DBA_ views. The untrusted administrator can monitor XStream with ALL_ views. Specify CAPTURE for the privilege_type parameter if the XStream administrator manages only an XStream Out configuration on the database. Specify * for the privilege_type parameter if the XStream administrator manages both an XStream Out and an XStream In configuration on the database. The GRANT_ADMIN_PRIVILEGE procedure grants privileges for Oracle-supplied views and packages that are required to run components in an XStream Out or XStream In configuration. This procedure does not grant privileges on database objects owned by users. If such privileges are required, then they must be granted separately. A capture process can be associated with only one user, but one user can be associated with many capture processes. Grant privileges to the capture user with the DBMS_XSTREAM_AUTH package by specifying CAPTURE for the privilege_type parameter in the GRANT_ADMIN_PRIVILEGE procedure. "Configure an XStream Administrator on All Databases"
"Changing the Capture User of an Outbound Server's Capture Process"
The connect user sends LCRs that satisfy the outbound server's rule sets to the XStream client application. In addition, the connect user runs all custom rule-based transformations specified by the rules in these rule sets. A outbound server can be associated with only one user, but one user can be associated with many outbound servers. "Privileges Required by the Connect User for an Outbound Server"
"Changing the Connect User for an Outbound Server"
XStream Out can work with Oracle Real Application Clusters (Oracle RAC). XStream Out can work with Transparent Data Encryption. XStream Out supports tables in a flashback data archive. RMAN deletion policies can affect capture processes. XStream Out supports distributed transactions. A multitenant environment enables an Oracle database to contain a portable set of schemas, objects, and related structures that appears logically to an application as a separate database. This self-contained collection is called a pluggable database (PDB). A multitenant container database (CDB) contains PDBs. In a CDB, XStream Out functions much the same as it does in a non-CDB. A capture process can capture changes in an Oracle Real Application Clusters (Oracle RAC) environment. You can configure queues in an Oracle Real Application Clusters (Oracle RAC) environment. A propagation can propagate LCRs from one queue to another in an Oracle Real Application Clusters (Oracle RAC) environment. A propagation job running on an instance propagates logical change records (LCRs) from any queue owned by that instance to destination queues. You can configure an outbound server in an Oracle Real Application Clusters (Oracle RAC) environment provided you have set use_rac_service to Y in the procedure DBMS_CAPTURE_ADM.SET_PARAMETER. If you use one or more capture processes and Oracle RAC in the same environment, then all archived logs that contain changes to be captured by a capture process must be available for all instances in the Oracle RAC environment. In an Oracle RAC environment, a capture process reads changes made by all instances. Multiple outbound server processes that use the same capture process must run in the same Oracle RAC instance as the capture process. You ensure that the capture process runs in the same Oracle RAC instance as its queue by setting the parameter use_rac_service to Y in the procedure DBMS_CAPTURE_ADM.SET_PARAMETER. If the value for the capture process parameter use_rac_service is set to Y, then each capture process is started and stopped on the owner instance for its ANYDATA queue, even if the start or stop procedure is run on a different instance. Also, a capture process follows its queue to a different instance if the current owner instance becomes unavailable. The queue itself follows the rules for primary instance and secondary instance ownership. If the value for the capture process parameter use_rac_service is set to N, then the capture process is started on the instance to which the client application connects. Stopping the capture process must be performed on the same instance where the capture process was started. If the owner instance for a queue table containing a queue used by a capture process becomes unavailable, then queue ownership is transferred automatically to another instance in the cluster. In addition, if the capture process was enabled when the owner instance became unavailable, then the capture process is restarted automatically on the new owner instance. If the capture process was disabled when the owner instance became unavailable, then the capture process remains disabled on the new owner instance. LogMiner supports the LOG_ARCHIVE_DEST_n initialization parameter, and capture processes use LogMiner to capture changes from the redo log. If an archived log file is inaccessible from one destination, then a local capture process can read it from another accessible destination. On an Oracle RAC database, this ability also enables you to use cross instance archival (CIA) such that each instance archives its files to all other instances. This solution cannot detect or resolve gaps caused by missing archived log files. Hence, it can be used only to complement an existing solution to have the archived files shared between all instances. In a downstream capture process environment, the source database can be a single instance database or a multi-instance Oracle RAC database. The downstream database can be a single instance database or a multi-instance Oracle RAC database, regardless of whether the source database is single instance or multi-instance. In an Oracle RAC environment, only the owner instance can have a buffer for a queue, but different instances can have buffers for different queues. A buffered queue is System Global Area (SGA) memory associated with a queue. You set the capture process parameter use_rac_service to Y to specify ownership of the queue table or the primary and secondary instance for a given queue table. XStream Out processes and jobs support primary instance and secondary instance specifications for queue tables. If use_rac_service is set to Y, you can use the specifications for queue tables and the secondary instance assumes ownership of a queue table when the primary instance becomes unavailable. The queue ownership is transferred back to the primary instance when it becomes available again. If the owner instance for a queue table containing a destination queue for a propagation becomes unavailable, then queue ownership is transferred automatically to another instance in the cluster. If both the primary and secondary instance for a queue table containing a destination queue become unavailable, then queue ownership is transferred automatically to another instance in the cluster. In this case, if the primary or secondary instance becomes available again, then ownership is transferred back to one of them accordingly. You can set primary and secondary instance specifications using the ALTER_QUEUE_TABLE procedure in the DBMS_AQADM package. The ALL_QUEUE_TABLES data dictionary view contains information about the owner instance for a queue table. A queue table can contain multiple queues. In this case, each queue in a queue table has the same owner instance as the queue table. The NETWORK_NAME column in the ALL_QUEUES data dictionary view contains the network name for a queue service. Do not manage the services for queues in any way. Oracle manages them automatically. The information in this section only applies to XStream configurations that include propagations. In a typical XStream configuration, an outbound server and its capture process are configured on the same database, and propagation is not required. The information in this section does not apply to configurations that do not include propagation. However, it is possible to configure a capture process on one database and an outbound server on another database. In this case, a propagation sends LCRs from the capture process's queue to the outbound server's queue. Before you can propagate LCRs in an Oracle RAC environment, you must set use_rac_service to Y in the procedure DBMS_CAPTURE_ADM.SET_PARAMETER. Any propagation to an Oracle RAC database is made over database links. The database links must be configured to connect to the destination instance that owns the queue that will receive the LCRs. A queue-to-queue propagation to a buffered destination queue uses a service to provide transparent failover in an Oracle RAC environment. That is, a propagation job for a queue-to-queue propagation automatically connects to the instance that owns the destination queue. The service used by a queue-to-queue propagation always runs on the owner instance of the destination queue. This service is created only for buffered queues in an Oracle RAC database. If you plan to use buffered messaging with an Oracle RAC database, then LCRs can be enqueued into a buffered queue on any instance. If LCRs are enqueued on an instance that does not own the queue, then the LCRs are sent to the correct instance, but it is more efficient to enqueue LCRs on the instance that owns the queue. You can use the service to connect to the owner instance of the queue before enqueuing LCRs into a buffered queue. Because the queue service always runs on the owner instance of the queue, transparent failover can occur when Oracle RAC instances fail. When multiple queue-to-queue propagations use a single database link, the connect description for each queue-to-queue propagation changes automatically to propagate LCRs to the correct destination queue. If a queue contains or will contain captured LCRs in an Oracle RAC environment, then use queue-to-queue propagations to propagate LCRs to an Oracle RAC destination database. Each outbound server is started and stopped on the owner instance for its ANYDATA queue, even if the start or stop procedure is run on a different instance. A coordinator process, its corresponding apply reader server, and its apply server run on a single instance. Multiple XStream Out processes that use the same capture process must run in the same Oracle RAC instance as the capture process. If the owner instance for a queue table containing a queue used by an outbound server becomes unavailable, then queue ownership is transferred automatically to another instance in the cluster. Also, an outbound server will follow its queue to a different instance if the current owner instance becomes unavailable. The queue itself follows the rules for primary instance and secondary instance ownership. In addition, if the outbound server was enabled when the owner instance became unavailable, then the outbound server is restarted automatically on the new owner instance. If the outbound server was disabled when the owner instance became unavailable, then the outbound server remains disabled on the new owner instance. Capture processes can capture changes to columns that have been encrypted using Transparent Data Encryption. A propagation can propagate row logical change records (row LCRs) that contain changes to columns that were encrypted using Transparent Data Encryption. An outbound server can process implicitly captured row logical change records (row LCRs) that contain columns encrypted using Transparent Data Encryption. A local capture process can capture changes to columns that have been encrypted using Transparent Data Encryption. A downstream capture process can capture changes to columns that have been encrypted only if the downstream database shares an encryption keystore (container for authentication and signing credentials) with the source database. A keystore can be shared through a network file system (NFS), or it can be copied from one computer system to another manually. When a keystore is shared with a downstream database, ensure that the ENCRYPTION_WALLET_LOCATION parameter in the sqlnet.ora file at the downstream database specifies the keystore location. If you copy a keystore to a downstream database, then ensure that you copy the keystore from the source database to the downstream database whenever the keystore at the source database changes. Do not perform any operations on the keystore at the downstream database, such as changing the encryption key for a replicated table. Encrypted columns in row logical change records (row LCRs) captured by a local or downstream capture process are decrypted when the row LCRs are staged in a buffered queue. A capture process only supports encrypted columns if the redo logs used by the capture process were generated by a database with a compatibility level of 11.0.0 or higher. The compatibility level is controlled by the COMPATIBLE initialization parameter. When a propagation propagates row LCRs with encrypted columns, the encrypted columns are decrypted while the row LCRs are transferred over the network. You can use the features of Oracle Advanced Security to encrypt data transfers over the network if necessary. When row LCRs with encrypted columns are processed by an outbound server, the encrypted columns are decrypted. These row LCRs with decrypted columns are sent to the XStream client application. When row LCRs with encrypted columns are stored in buffered queues, the columns are decrypted. When row LCRs spill to disk, XStream transparently encrypts any encrypted columns while the row LCRs are stored on disk. Because the same keystore needs to be available and open in any instance where columns are encrypted, make sure you copy the keystore to the downstream capture database. In the case of a downstream capture, you must also run the above commands on the downstream instance. Capture processes can capture data manipulation language (DML) and data definition language (DDL) changes made to these tables. Outbound servers can process the captured LCRs. XStream Out does not capture changes made to internal tables used by a flashback data archive. Some RMAN deletion policies and commands delete archived redo log files. If one of these RMAN policies or commands is used on a database that generates redo log files for one or more capture processes, then ensure that the RMAN commands do not delete archived redo log files that are required by a capture process. When a local capture process is configured, RMAN does not delete archived redo log files that are required by the local capture process unless there is space pressure in the fast recovery area. When a downstream capture process captures database changes made at a source database, ensure that no RMAN deletion policy or command deletes an archived redo log file until after it is transferred from the source database to the downstream capture process database. "Checking the Trace File and Alert Log for Problems"
Specifically, RMAN does not delete archived redo log files that contain changes with system change number (SCN) values that are equal to or greater than the required checkpoint SCN for the local capture process. This is the default RMAN behavior for all RMAN deletion policies and DELETE commands, including DELETE ARCHIVELOG and DELETE OBSOLETE. When there is not enough space in the fast recovery area to write a new log file, RMAN automatically deletes one or more archived redo log files. Oracle Database writes warnings to the alert log when RMAN automatically deletes an archived redo log file that is required by a local capture process. This deletion policy requires that a log file be backed up integer times before it is considered for deletion. When no backups of the archived redo log files are taken on the local capture process database, no specific deletion policy is recommended. By default, RMAN does not delete archived redo log files that are required by a local capture process. The RMAN command CONFIGURE ARCHIVELOG DELETION POLICY sets a deletion policy that determines when archived redo log files in the fast recovery area are eligible for deletion. The deletion policy also applies to all RMAN DELETE commands, including DELETE ARCHIVELOG and DELETE OBSOLETE. A deletion policy set TO SHIPPED TO STANDBY does not delete a log file until after it is transferred to a downstream capture process database that requires the file. These log files might or might not have been processed by the downstream capture process. Automatic deletion occurs when there is not enough space in the fast recovery area to write a new log file. A deletion policy set TO APPLIED ON STANDBY does not delete a log file until after it is transferred to a downstream capture process database that requires the file and the source database marks the log file as applied. The source database marks a log file as applied when the minimum required checkpoint SCN of all of the downstream capture processes for the source database is greater than the highest SCN in the log file. A deletion policy set to BACKED UP integer TIMES TO DEVICE TYPE requires that a log file be backed up integer times before it is considered for deletion. A log file can be deleted even if the log file has not been processed by a downstream capture process that requires it. A deletion policy set TO NONE means that a log file can be deleted when there is space pressure on the fast recovery area, even if the log file has not been processed by a downstream capture process that requires it. The log files satisfy the condition specified in the DELETE ARCHIVELOG command. The log files can be deleted according to the CONFIGURE ARCHIVELOG DELETION POLICY. For example, if the policy is set TO SHIPPED TO STANDBY, then this command does not delete a log file until after it is transferred to any downstream capture process database that requires it. This behavior applies when the database is mounted or open. If archived redo log files are not deleted because they contain changes required by a downstream capture process, then RMAN displays a warning message about skipping the delete operation for these files. The log files are obsolete according to the retention policy. The database is mounted or open. The log file is required by a downstream capture process. The deletion policy is set TO SHIPPED TO STANDBY. At a downstream capture process database, archived redo log files transferred from a source database are not managed by RMAN. A capture process captures changes made to the source database during a distributed transaction using either of these two methods and sends the changes to an outbound server. An outbound server sends the changes in a transaction to a client application after the transaction has committed. However, the distributed transaction state is not sent. The client application does not inherit the in-doubt or prepared state of such a transaction. Also, the outbound server does not send the changes using the same global transaction identifier used at the source database for XA transactions. XStream Out supports changes made by loosely coupled XA branches regardless of the COMPATIBLE initialization parameter value. XStream Out supports replication of changes made by tightly coupled branches on an Oracle RAC source database only if the COMPATIBLE initialization parameter set to 11.2.0.0 or higher. This section assumes that you understand multitenant architecture concepts. See Oracle Database Concepts for information. XStream Out must be configured in the root and not in any of the PDBs. XStream Out can see changes made to any container within the CDB (root and all the PDBs). XStream Out capture rules can limit the LCRs to those that are needed for the client application. The system-generated capture rules select the appropriate LCRs based on the parameters that were passed to the ADD_OUTBOUND and CREATE_OUTBOUND procedures in the DBMS_XSTREAM_ADM package. You can use the ADD_*_RULES procedures in the same package for more fine-grained control over the rules used by the XStream Out components. The user who performs XStream Out tasks must be a common user. "System-Created Rules and a Multitenant Environment"
"Configuring XStream Out with Local Capture in a CDB"
When a PDB involved with XStream Out is unplugged from its CDB and plugged into another CDB, any capture process or outbound server is not considered part of the PDB. You must configure the capture process and outbound server again in the new CDB. If an outbound server is configured in a different database than the capture process, then unplug and plug operations have additional considerations. A CDB A with PDB PDB1. A capture process is configured in CDB A, and it sends LCRs from PDB1 to an outbound server in CDB B. You unplug PDB1 from CDB A, and plug it into CDB C.
To continue delivering LCRs from PDB1 to the outbound server in CDB B, you must configure a new capture process in CDB C to capture and send LCRs to CDB B. The rules used by the outbound server in database B must be altered to change references to the root of CDB A to the root of CDB C. In addition, if PDB1 was given a different name in CDB C, then the rules must be altered to reflect the new PDB name.